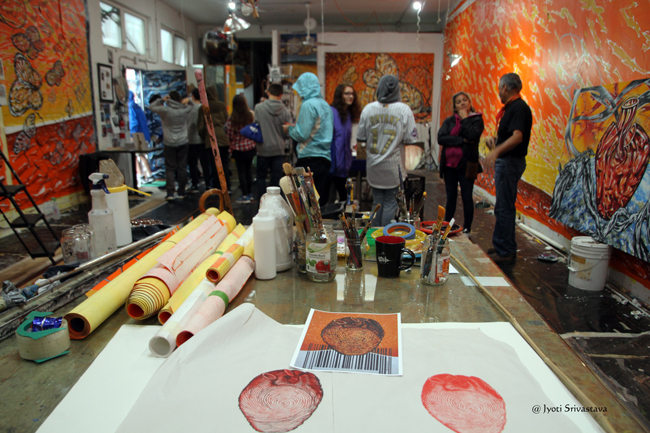 On a cold, rainy day of October 14, 2017, I visited the studio of artist Hector Duarte. 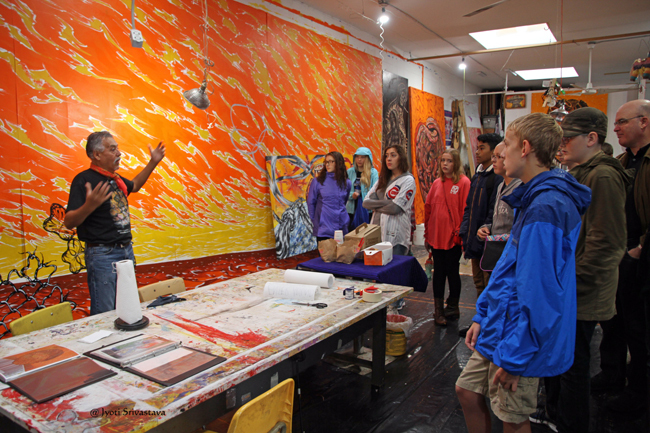 The studio was vibrant and warm, with brightly colored murals on the walls that would cheer anyone on a cold damp day! It was the first time that I was meeting the artist. He was very polite and courteous and willing to talking about his art. I at once felt welcomed and comfortable. 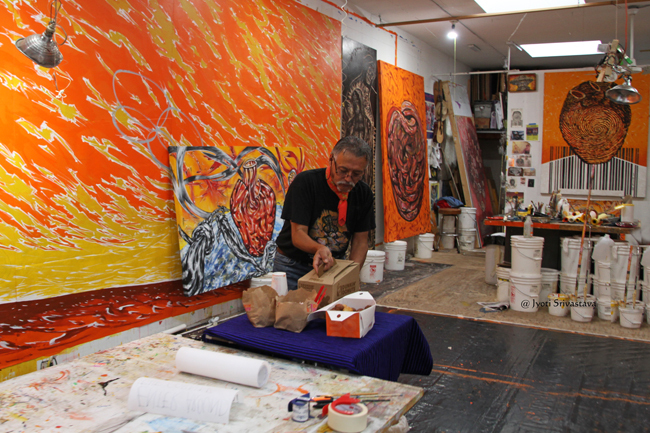 Before I write about his studio, here is a short introduction of the artist. 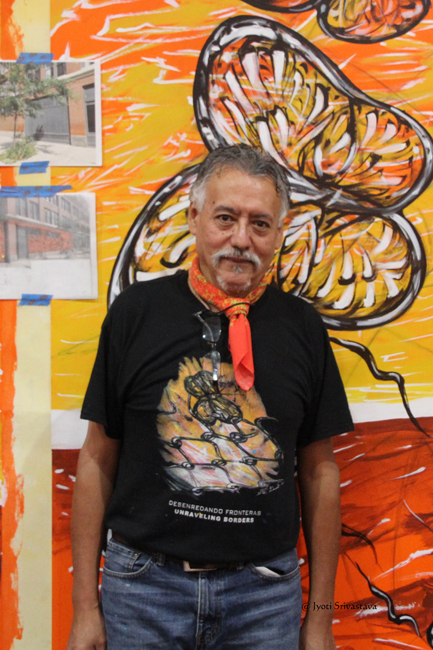 Hector Duarte is a well known artist muralist in Chicago and his native Michoacán, Mexico. 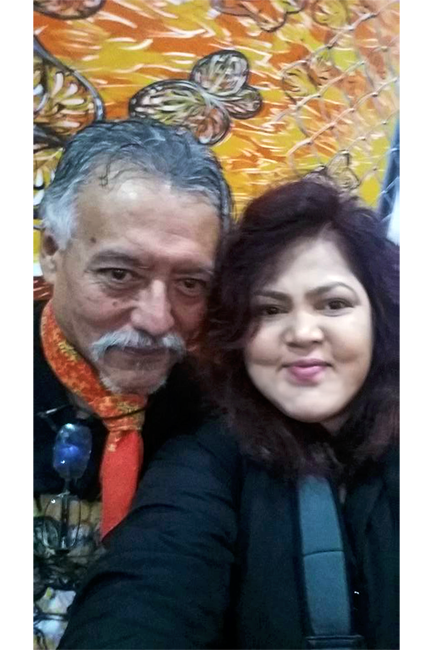 He was born in 1952 in Caurio, Michoacán, Mexico. 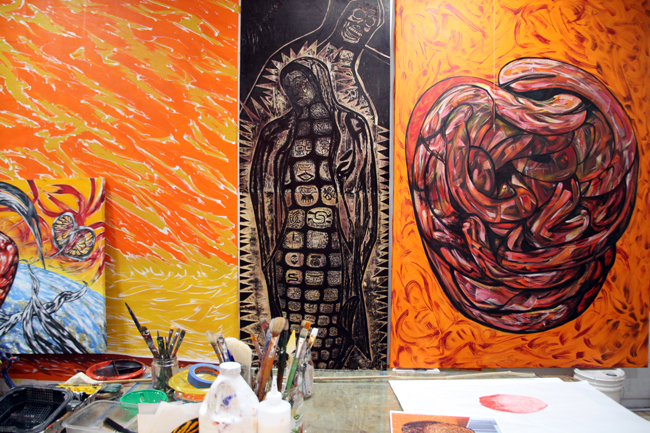 In 1977, he studied mural painting at the workshop of David Alfaro Siquieros, one of the giants of Mexican muralism. He moved to Chicago in 1985. 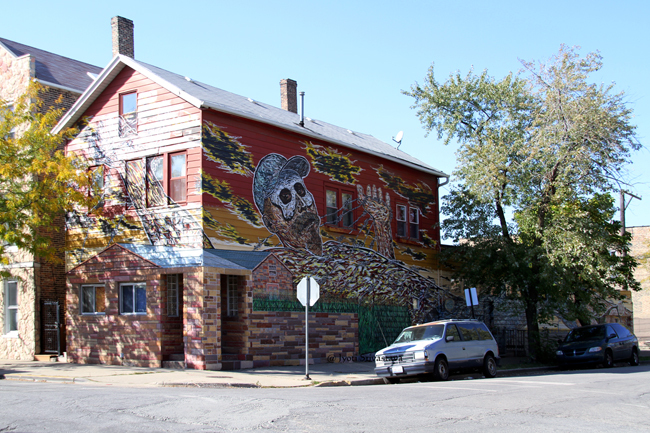 He has created more than 50 murals that can be seen in schools libraries, transit stops and neighborhoods throughout Chicagoland area and beyond. 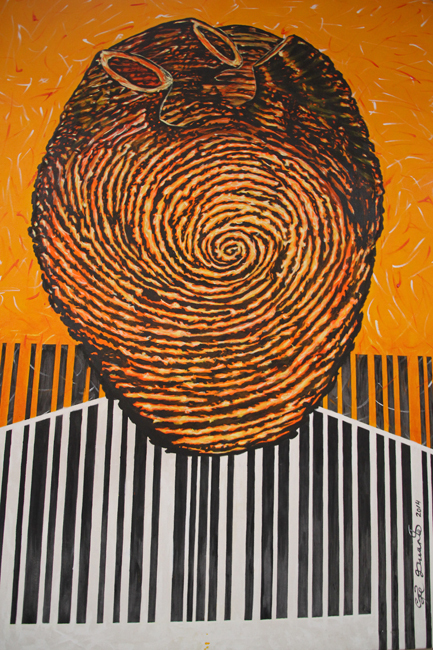 His paintings and prints have been exhibited at the National Museum of Mexican Art, the School of the Art Institute of Chicago, the State of Illinois Gallery, the Chicago Historical Society and Casa Estudio Museo Diego Rivera in Mexico City. “Gulliver in Wonderland” mural – Hector Duarte Studio. Since it was a rainy day, I had taken a cab. 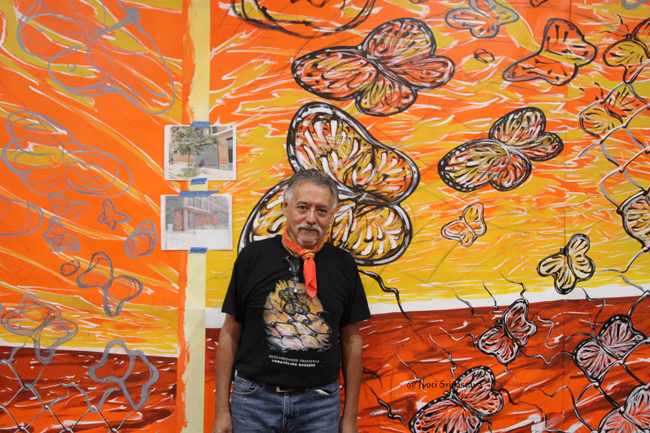 It was easy to find his home-studio, as the artist-muralist Hector Duarte it with large mural he calls “Gulliver in Wonderland.” The artwork covers roughly 3,000 square feet on three sides of his studio-home. The mural features a giant, outstretched immigrant as Gulliver, struggling to break free from the barbed wire that binds him. Duarte used the figure of Gulliver from Gulliver’s Travels as a starting point for the mural. The work is meant as a commentary on the situation that many immigrants find themselves in when they come to the United States [Wonderland] and encounter a foreign language, a foreign culture, and hostility towards their presence. 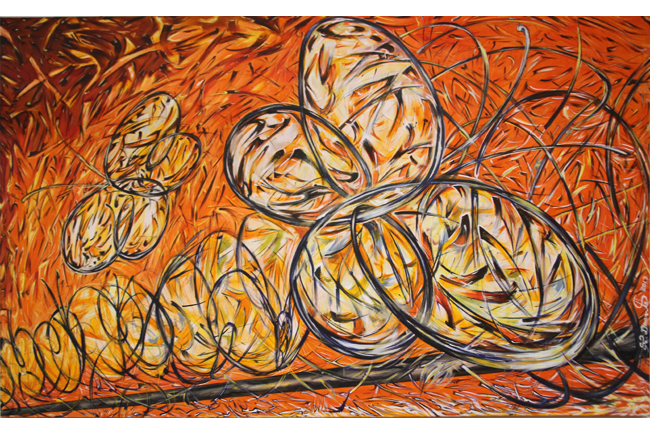 Duarte’s artwork deal with themes of identity, immigration and freedom. 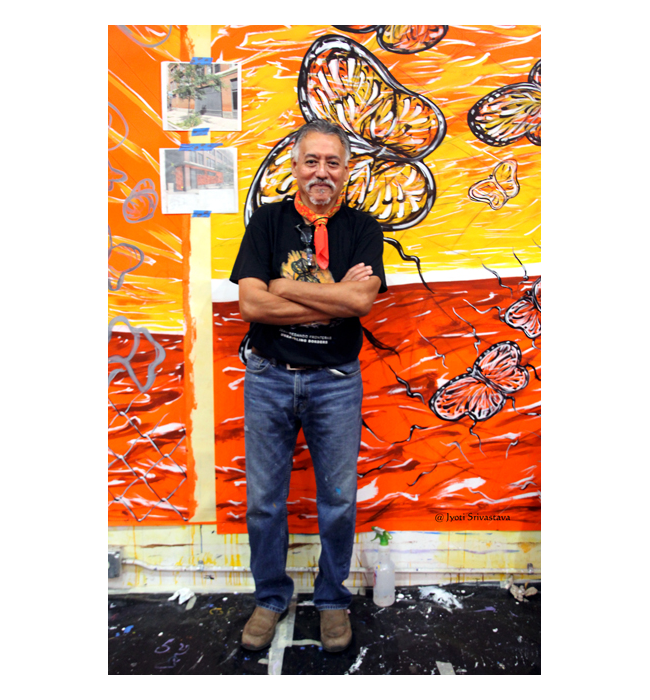 He frequently paints butterflies, especially monarch butterflies, that begin their journey from Mexico and travel all across the North American continent. His birthplace Caurio de Guadalup in Mexico is located near the heart of monarch’s winter habitat. Although he moved to Chicago, the butterflies of his childhood recur in his work as poignant metaphors of transition and transformation. Much like people leave their homeland the monarch’s voyage is a dangerous trip into the unknown. “The butterfly quietly continues to come and go across the North America continent, above and between and through razor wires and walls, like thousands of Mexican men and women who come and go across the border.” Generations later their descendants may return to their ancestral homes. 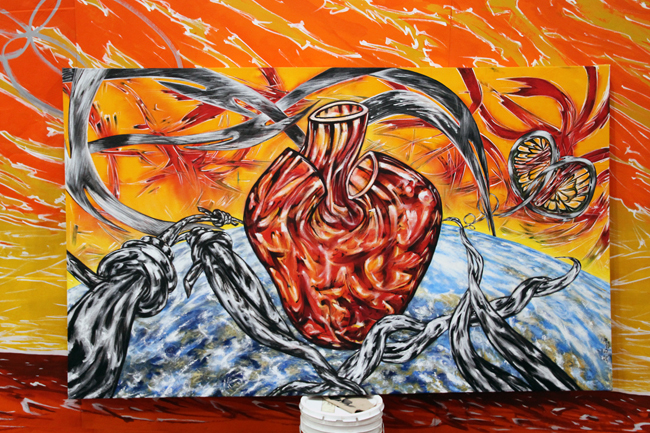 and it carries the message, Desenredando Fronteras [Unraveling Borders]. Open House Chicago.. click here..